Photo taken on Tues 03.12.13 in Huntington Beach by Ms. Jen with her Nikon D800 and a 85mm f1.8 lens. Tues 03.12.13 – For the last few days, marine inversion mists permitting, I have gone to a west facing beach or cliff to look for Comet PANSTARRS in the 30-45 minutes after the sunset. This evening was the first evening that I was able to get a photo of the Comet, above just to the left of the moon. I was so excited to see the comet clearly on the view screen of my Nikon, as the comet was not visible to the naked eye but only visible through binoculars. Saturday evening, my Dad and I went to the Point Vincente Interpretive Center in Rancho Palos Verdes. While we saw a few whales through the binoculars, listened to a wedding reception in progress, we did not see the comet at all as its position on the low western horizon was right in the marine fog bank off the coast. Sunday evening, two nights ago, my Dad and I drove down to the Huntington Cliffs just above Dog Beach in Huntington Beach, and waited for the comet to appear a bit higher on the horizon above the shipping lanes just between the northwest end of Catalina Island and Point Fermin in San Pedro. We were able to see the comet just above a big oil tanker and passed the binoculars around for others to find it. I had no luck with getting any pictures, as I had my Nokias’s with 26mm lenses and a sharp 50mm lens on my Nikon. Last night, I was very tired and just walked out to the River’s End here in Seal Beach and did not see any comet at all due to the big fog bank sitting off the coast that extended about 20 degrees into the sky. I could barely see Sirius the dog star in the southern sky through the fog bank and Sirius is our brightest local star. Tonight, after a long day at Lukas’s first birthday lunch party and a slog through the 405 southbound traffic, I decided to not go out as I could see how misty the ocean air was. But just as the sun set, I noticed the mist cleared up here in Seal Beach, so I loaded my gear into the car and drove as fast as possible down to the Huntington Cliffs. As I arrived in the Dog Beach/Huntington Cliffs parking lot, I saw that a lot of other folks where already there with binoculars, cameras on tripods, and one guy with a large fat telescope. I parked myself at the end of the line up of folks at the cliff’s railing, looked out saw a beautiful crescent / new moon, lifted my binoculars and there she was: Comet PANSTARRS! After struggling to set up my creaky, elderly tripod, I started taking photos with my Nikon 85mm f1.8D portrait lens, and a fine portrait of the comet I got. 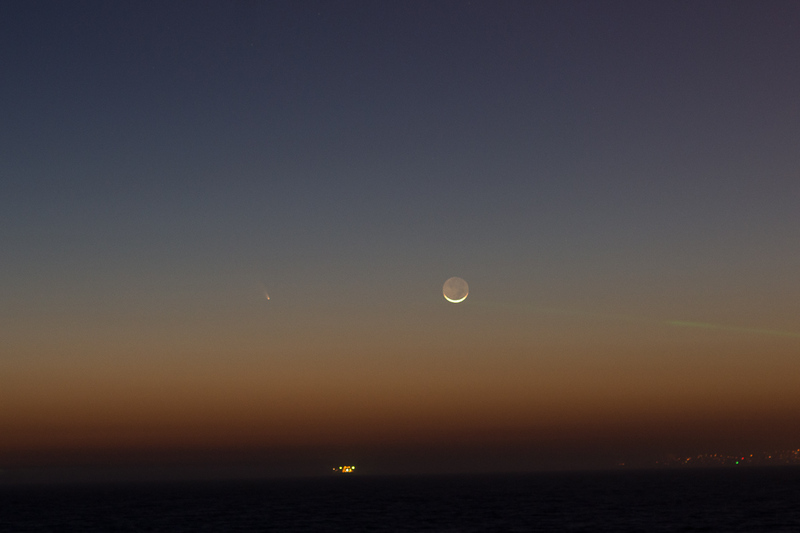 I passed my binoculars to a family next to me so that they and the kids could see the comet, while I took another six good photos of the moon, the comet, and the shipping lane with San Pedro on the far right. The above photo is cropped and a bit corrected in Lightroom. The larger, non-cropped, non-corrected version is up on my flickr stream. If you want to try to see Comet PANSTARRS, go out tonight through Friday, to a western facing vantage point just after sunset, take binoculars, look for the moon and there will be the comet. by Ms. Jen on Tue March 12, 2013 | Permalink | Uncategorized.